BIG MACHINE RECORDS’ TAYLOR SWIFT made a surprise appearance at NASHVILLE’s BLUEBIRD CAFE over the weekend to perform for the intimate crowd. SWIFT was welcomed to the stage by veteran songwriter CRAIG WISEMAN, who was the BLUEBIRD’s main billing on SATURDAY, MARCH 31st. SWIFT performed “Shake It Off;” “Better Man,” which she wrote for LITTLE BIG TOWN; and “Love Story,” which SWIFT told the crowd she originally intended to co-write with WISEMAN before he opted out of the session, according to the TENNESSEAN. SWIFT’s performance at the BLUEBIRD was filmed for a documentary that will honor the venue’s 35th anniversary. The iconic NASHVILLE landmark holds personal significance for SWIFT, as it was there that BIG MACHINE LABEL GROUP Pres./CEO SCOTT BORCHETTA first heard SWIFT play, when she was only in eighth grade, and offered her a publishing deal. SWIFT has spent recent years dominating the Pop charts and is currently preparing for her “REPUTATION TOUR,” which is set to kick off next month. These days it seems that country music news sites can’t so much as MENTION Taylor Swift without a huge social media backlash of comments like “Taylor Swift abandoned her country fans!” and “Who cares? She’s pop music now“. This leaves us who cover the industry in a pickle. You see, while the songs she puts out are no longer what is widely accepted as country music, and she has done everything she can to distance herself and her career from the moral and social restraints that the Nashville crowd press upon young female artists, the fact of the matter is that the country music industry still heavily relies on artists like Taylor Swift to finance hundreds of other budding careers and an entire concert tour support system. At a current net worth of over $44MILLION, Taylor Swift’s every career move means money. According to Forbes, her 1989 tour run obliterated previous tour earning records earning a gross of around a quarter BILLION dollars. When you think about it, that’s a lot of jobs. Stage hands, dancers, security, support staff, even the 16 year old kid making corndogs in a stadium food court is benefiting by Taylor’s tour. [bctt tweet=”Why #CountryMusic still cares about @TaylorSwift13 and the #TS6 release. ” username=”My_CountryMusic”] Beyond that is the way that a flagship artist like Taylor can either make or break entire record labels. How many smaller artists on Big Machine Records would never have a PR team or a label advance if the label did not have a successful champion raking it in on the front end? Artists like Brantley Gilbert, Justin Moore, and Thomas Rhett all get their tours, albums and publicity funded upfront by the artists that are raking it in ahead of them on the marquee like Taylor, Reba, Rascal Flatts, and Hank Jr. Flagship artists are the building blocks of a successful music economy, so the next time you think “who cares”, then answer with the name of the last artist you went to see and every person behind the scenes who’s job is more secure today than it was before the Taylor Swift Eclipse. 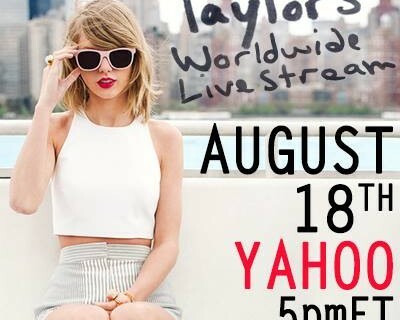 Like clockwork, Taylor Swift is back again this fall with a brand new album, and let fans know with a special livestream broadcast today on Yahoo! Music. The livestream featured the release of Shake It Off, and you can see the video in its entirety below. We’re honestly still scratching our heads here at CMNB HQ… we know Taylor has never been pure country at any point in her career, but it seems that with this album, the last remaining twang she held onto is what’s getting “shaken off”. Taylor Swift Live Online! Huge Announcement! Taylor Swift Leads In Billboard Music Award Nominations. Country Music will be represented in Las Vegas yet again, as another award show is coming up. Taylor Swift, Kacey Musgraves and The Band Perry are all scheduled to perform at this year’s Billboard Music Awards. The show will air live Sunday, May 19 on ABC from the MGM Grand Garden Arena in Las Vegas. Country Nominees: Swift has a pretty good chance of taking at least one award home, seeing how she has 11 nominations for the night. Swift is in the running for Top Artist, Top Billboard 200 Album, Top Female Artist, Top Hot 100 Artist, Top Billboard 200 Artist, Top Digital Songs Artist, Top Social Artist, Top Country Artist, Top Country Album, Top Streaming Song (Video) and Top Country Song. Swift is also up for the Milestone Award. Jason Aldean is up for three awards: Top Male Artist, Top Country Artist and Top Country Album. Luke Bryan also has three nominations: Top Country Artist, Top Country Album and Top Country Song. Hunter Hayes is up for Top Country Artist and Top Country Song. Carrie Underwood is nominated for Top Country Artist and Top Country Album. Lionel Richie is nominated for Top Country Album and Eric Church and Florida Georgia Line are also up for Top Country Song. Taylor Swift Invites Country Newbie Joel Crouse, Florida Georgia Line and more to Join her 2013 Red Tour! Taylor Swift will be kicking off her brand new 2013 RED Tour on March 13th, and she’s inviting a few more talented folks to join her on the road! Swift and her team previously announced that singer/songwriter Ed Sheeran, whose duet with Taylor, “Everything Has Changed,” is featured on her Red album, would be joining what will no doubt be a hugely successful tour. Now though, fans are going to have extra incentive to turn out to the RED tour shows. In addition to Sheeran, Tswift will be including country music new kid, Joel Crouse, and other super popular country acts like Florida Georgia Line, Casey James and Brett Eldredge. Taylor’s Red album is easily the LEAST country of all of her releases so far, and she’s been receiving a fair amount of flack for it. So, I’m thinking that the addition of these new country artists has a lot to do with trying to stay in touch with the country music fan base. Smart move, if you ask me, and the new additions are sure to make the RED 2013 Tour a blast for fans. Not to mention, all of these guys are going to get a tremendous amount of exposure from this, and it’s well deserved. See below for details on the 13 Stadium tour stops. Taylor Swift Won Favorite Country Artist at 2013 People’s Choice Awards. Last night the 2013 People’s Choice Awards aired LIVE on CBS, and Taylor Swift walked away with the lone country awards for Favorite Country Artist. She was up against Blake Shelton, Carrie Underwood, Jason Aldean and Tim McGraw. Taylor and Carrie were also nominated for Favorite Female Artist but the award went to Katy Perry. Swift wore a gorgeous white Ralph Lauren gown that really put in her a more mature light! Tswift is all grown up! See the dress below. Taylor Swift In Ralph Lauren Gown at 2013 People’s Choice Awards. Taylor Swift Tops The List of Most Giving Celebrities of 2012. Sure, we all spend a lot of time talking about Taylor Swift and her romances, and of course, her music, which consistently tops charts in country and beyond. Yet, this time Taylor has topped an entirely different, more charitable chart. Turns out, TSwift has taken all that notoriety and money she’s been earning, and used it for good. For 2012, the 23 year old singer tops the list of the most giving celebrities according to dosomething.org. This year Taylor gave the largest sum ever to Nashville’s Country Hall of Fame Museum to the tune of $4 million! She was also the youngest winner of the Ripple of Hope Award which honors leaders in the community demonstrating a “commitment to social change.” Swift also spends time and money supporting the battle against cancer for young people. So, let’s all just take a collective moment, and appreciate the fact, despite what you might think about her relationship status or musical skills, TSwift is one of the folks willing to give back when she wins big. I’ll tip my hat to that. Video: Taylor Swift Performs Acoustic Version of Songs from New RED Album. As a special holiday treat for all her dedicated fans, Taylor Swift has released a video of an acoustic performance she recorded live from Nashville during her big reveal webcast back in August. She performs three of her songs from new album Red, including “We Are Never Ever Getting Back Together,” “Treacherous,” and “22.” So, Tswift fans, check out the video below and enjoy! Watch: Taylor Swift’s Acoustic Performance of Three Songs From Her RED Album.